Whispers in the Loggia: Just Bring It – On His 77th, Francis' "Action Plan"... and Birthday "Hope"
Just Bring It – On His 77th, Francis' "Action Plan"... and Birthday "Hope"
While the shop was bogged down with a Christmas-sized appointment drop, Tuesday saw the 77th birthday of the 266th Bishop of Rome... and to mark his first cumpleaños in the driver's seat, Francis went on yet another joyride – well, as much of one as he can have these days. After Birthday Mass and breakfast with the staff of his Domus-home and four homeless men found with their dog outside the Vatican (below) by the new Papal Almoner, Archbishop Konrad Krajewski – who Francis rapidly whisked into the ancient post on learning of the veteran Polish MC's impromptu nighttime ministry to the poor in the surrounding streets – the first Jesuit Pope fulfilled a centuries-old aspiration of his religious family by inscribing the name of Blessed Peter Faber, the first companion of Ignatius and Francis Xavier, into the company of the saints, short-circuiting the normal canonization process. In his August interview with Antonio Spadaro SJ for Civiltà Cattolica – the complete, six-hour transcript of which will soon be published in English under the title My Door Is Always Open (Bloomsbury) – Francis spoke of Faber as a "model" for himself, both as a Jesuit and now in the governance of the universal church. The Pope said he admired Faber for his ability to "dialogue with all, even the most remote and even with his opponents; his simple piety, a certain naïveté perhaps, his being available straightaway, his careful interior discernment, the fact that he was a man capable of great and strong decisions but also capable of being so gentle and loving." 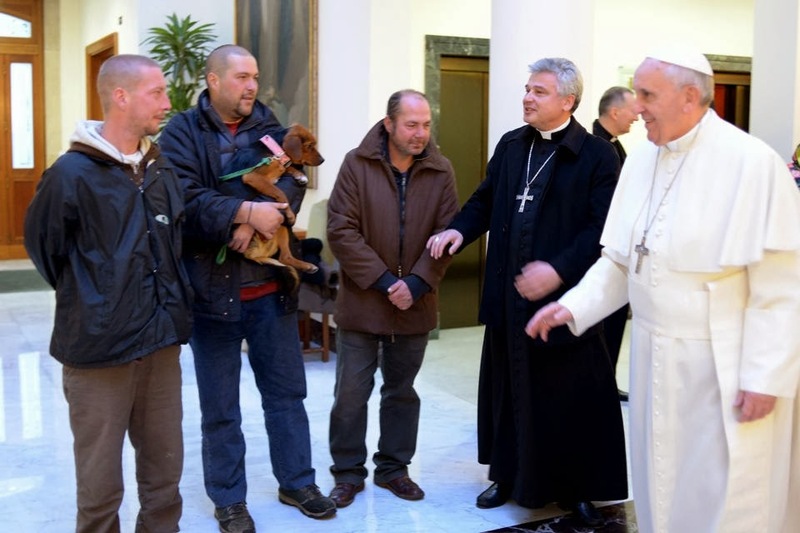 As the Italian Jesuit explained it, for Francis, the new saint exemplifies the figure of "'the reformed priest,' for whom interior experience, dogmatic expression and structural reform are intimately inseparable." 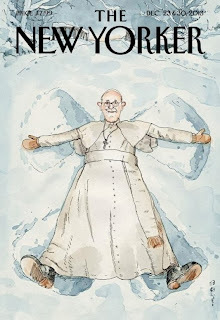 Accordingly, the title Spadaro gave the first blockbuster papal interview – "A Big Heart Open to God" – came neither from the Jesuit Constitutions nor anything of Ignatius', but from the spiritual diary of Peter Faber. To cap off the festivities, yesterday's General Audience (fulltext) saw a return pilgrimage of Papa Bergoglio's hometown soccer-squad – los Cuervos (the "Crows") of San Lorenzo Almagno – who brought the pontiff their championship trophy from Argentina's Premier Division three days after claiming it. 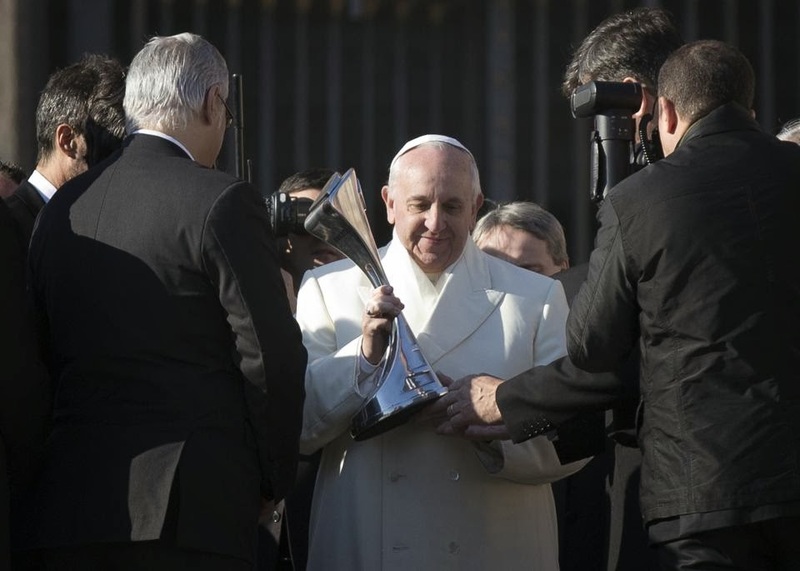 A lifelong booster of the team, San Lorenzo dedicated its win to the Pope. In return, they got prima fila (front row) at the final audience of the year, plus a private half-hour with their honorary chaplain afterward. On a related note, the prefecture of the Papal Household revealed earlier this week that Francis' 30 Wednesday gatherings since his election have seen the attendance of over 1.5 million ticketed individuals within St Peter's Square itself. The figure doesn't include the non-ticketed overflows down the Via della Conciliazione which have made the Wednesday turnouts almost routinely swell beyond 100,000. 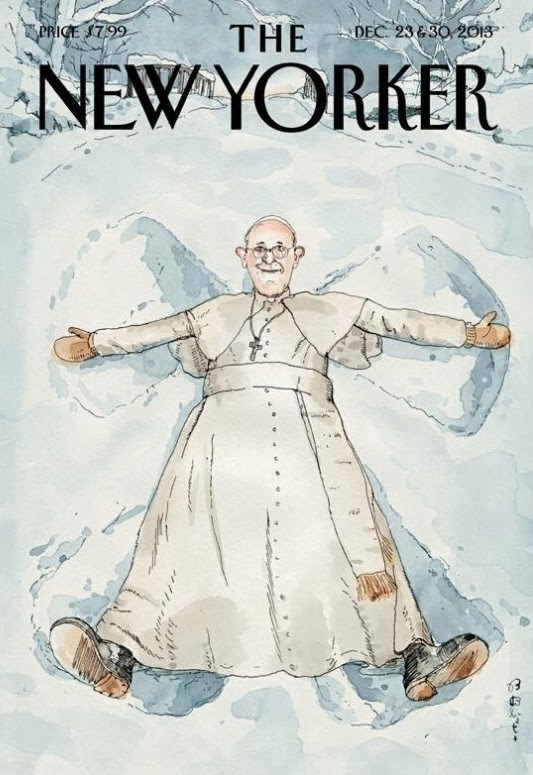 The figures for the new Pope's Sunday Angelus appearances – which, earlier this year, required a last-minute reroute of the Rome Marathon away from the Vatican due to the newfound throng – remain to be released. Francis' double-sevens comes with equally perfect timing, as the close of a stunning year brings even more incredible developments to Peter's doorstep. As it's impossible to summarize the whole of these months in any succinct form, though, we'll just have to pick one moment – even if, the way all this is rolling, something tomorrow could upend the cycle all over again. Indeed, that's happened more times since the evening of 13 March than we could count. Needless to say, to single out any one thing from this year-long thrill-ride is anything but easy. Sure, the outside world has been fixated on the images of these months, yet even for as moving and extraordinary as they've been, the focus here is different by definition: the preaching and teaching that'll be translated into policy, the message that informs and is formed into ecclesial substance. Sure, the textbook on that front is Evangelii gaudium. The sweeping Apostolic Exhortation laying out the program of this pontificate might be the most readable (and, yes, shocking) papal document in memory... "Francismania," however, apparently has its limits – even within the church, getting a wide audience to take up what's actually in its pages has proven a more fraught exercise than overhauling the Curia will ever be. Long story short, folks: it's very easy to "read" events through the opinions of whatever teachers tickle your ears. The problem is, it's even more stupid – at least, if you ever seek to think for yourself. That said, perhaps the best convergence of the Pope's program and the short attention-span of our "throw-away" information culture dates back to late July in Rio, over what became the first American Pope's triumphant "homecoming" at the long-scheduled World Youth Day. 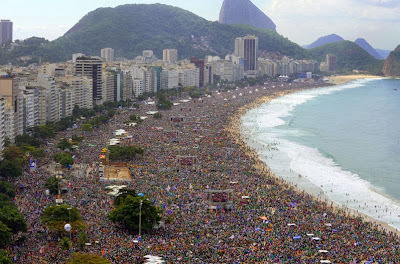 The scenes were surreal from the get-go, culminating in a crowd estimated at 3 million – the largest gathering in the continent's history – for the finale on Copacabana Beach. 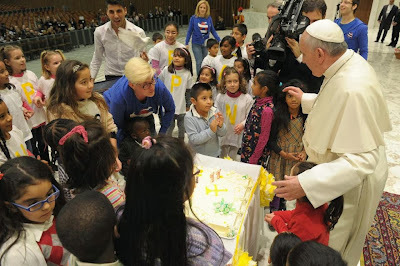 Along the way, though, Francis carved a slot in his schedule for the Argentine pilgrims to the event, who became the largest foreign delegation... just only after the Conclave. Um, I wanted to say something – to express my hope for what'll happen from [this] World Youth Day: I hope for noise. Noise here, OK. Here in Rio there will be plenty of noise, sure thing. But I want noise in the dioceses, I want for it to go out, I want the Church to go out into the streets! I want us to resist everything worldly, everything static, everything comfortable, everything of clericalism, everything that might make us closed in on ourselves. The parishes, the schools, the institutions are made for going outward ... and if they don’t, they become an NGO, and the Church cannot be an NGO! May the bishops and priests forgive me if some of your noise creates a bit of confusion after this. But this is my advice. Thank you for whatever you can do. Look, at this moment, I think our world civilization has gone beyond its limits, it has gone beyond its limits, because it has made such a cult of the money-god that we are now faced with a philosophy and a practice of exclusion of the two ends of life that are most full of promise for a people. They exclude the elderly, obviously. You could easily think there is a kind of hidden euthanasia, that is, we don’t take care of the elderly; but there is also a cultural euthanasia, because we don’t allow them to speak, we don’t allow them to act. And the exclusion of the young. The percentage of our young people that are without work, without employment, is very high and we have a generation with no experience of the dignity gained through work. This civilization, in other words, has led us to exclude the two peaks that make up our future. As for the young, they must come forward, they must assert themselves, the young must go out to fight for values, to fight for these values; and the elderly must open their mouths, the elderly must open their mouths and teach us! Pass on to us the wisdom of the people! Among the Argentine people, I ask the elderly, from my heart: do not cease to be the cultural storehouse of our people, a storehouse that hands on justice, hands on history, hands on values, hands on the memory of the people. And the rest of you, please, don't put yourselves away from the elderly: let them speak, listen to them and go onward. But know this, know that at this moment, you young people and you elderly people are condemned to the same destiny: exclusion. Don’t allow yourselves to be excluded. Got it? That’s why I think you must work. Faith in Jesus Christ is not a joke, it is something very serious. It is a scandal that God came to be one of us. It is a scandal that he died on a cross. It is a scandal: the scandal of the Cross. The Cross continues to provoke scandal. But it is the one sure path, the path of the Cross, the path of Jesus, the path of the Incarnation of Jesus. Please, do not water down your faith in Jesus Christ. We dilute fruit drinks – orange, apple, or banana juice, but please do not drink a diluted form of faith. Faith is whole and entire, not something that you water down. It is faith in Jesus. It is faith in the Son of God made man, who loved me and who died for me. So then: make your voices be heard; care for the two edges of the people: the elderly and the young; do not allow yourselves to be excluded and do not allow the elderly to be excluded. Secondly: do not “water down” your faith in Jesus Christ. It all flows together naturally. "What must we do, Father?" Look, read the Beatitudes: that will do you good. If you want to know what you actually have to do, read Matthew Chapter 25, which is the standard by which we will be judged. With these two things you have the action plan: the Beatitudes and Matthew 25. You do not need to read anything else. I ask this of you with all my heart. Well, I thank you for your closeness. It hurts me to see you all penned in, but let me tell you something – I've been feeling this myself, if I'm going to confess from my heart. What an ugly thing it is to be penned in. I openly admit it, but still, I understand it. I would've liked to come closer to you, but [I know] that for security reasons, it just isn’t possible. Thank you for coming, thank you for praying for me; I ask you from my heart, I need it. I need your prayers, I need you to pray for me, I need it very much. Thank you for it. OK, I want to give you my blessing now.... But don't forget: bring the noise; take care of the two ends of life, the two ends of our people's story: the elderly and the young; and do not water down the faith. And now let us pray, so as to bless the image of the Virgin, and then I will give you the Blessing. On a translation note, while the word "lío" was officially rendered by the Vatican as "noise" or in other, more sensational places as "a mess," the intended expression in English would be more akin to "a ruckus" – or, as one Latin friend put it, "[to] raise hell." Either way, Church, remember: it's only just beginning. do we turn with loving trust. In you there is no sin. and always love and cherish the life of every human being. In you is the fullness of joy born of life with God. and may this divine beauty save us, our city and the entire world.